The idea of the Festival of Britain first came about in 1943 when the Royal Society of Arts proposed an international exhibition to mark the centenary of the Great Exhibition of 1851. In 1947 the Labour Government decided that this should be a national celebration of Britain’s victory in the Second World War, to be held in the summer of 1951. It would provide a much needed boost to national morale and an optimistic vision for post-war recovery. By that time austerity measures were still in place, with continued rationing and restrictions on everyday items, as well as severe housing shortages. Much of London still lay in blitzed ruins. The main force behind the Festival was Herbert Morrison, the Labour MP for South Hackney and a former leader of the London County Council. Not everyone approved of the nation spending large amounts of money on temporary festivities at this time, but for many people it was a welcome relief from the austerity of their daily life. 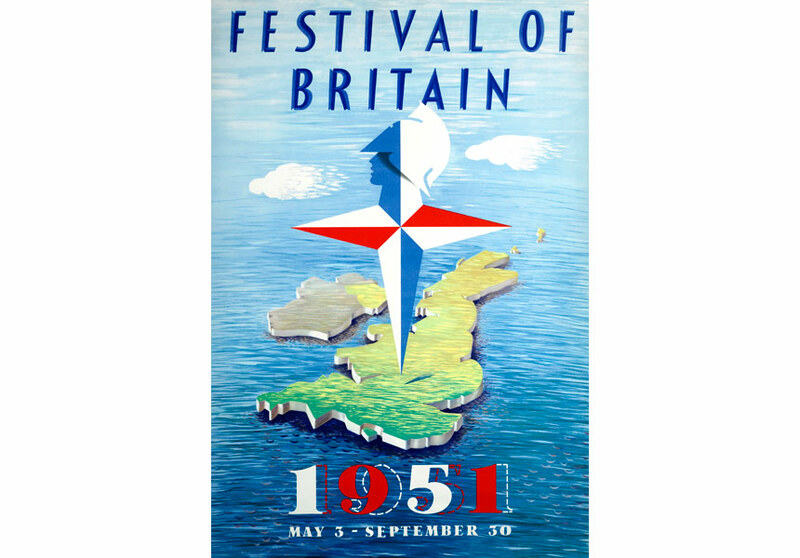 The Festival of Britain was a nationwide celebration, marked by thousands of events in cities, towns and villages across the country. The centrepiece was the South Bank exhibition. Here 27 acres of old bomb-damaged industrial buildings were swept away. In their place arose dazzling pavilions, futuristic structures and striking modern works of public art. The 19 pavilions told the story of Britain’s land and its people, and explored the nation’s contribution to civilisation through science, technology and industrial design. The huge saucer-shaped Dome of Discovery and the Skylon that appeared to float with no visible means of support dominated the site. Over 8 million people visited the exhibition. Most of the site was cleared soon after the Conservatives won the General Election in October 1951. However the Royal Festival Hall remained, and the old Telecinema was to become the National Film Theatre. Elsewhere in London, at Battersea Park, the Festival organisers created Pleasure Gardens with thrilling funfair rides, dancing and theatre, Punch and Judy shows and all sorts of amusements. In Poplar, there was an exhibition of ‘live’ architecture. Here a new housing estate was built in a bomb-scarred East End neighbourhood to show how modern principles of town planning could contribute to rebuilding the city. Over the Festival summer, many London boroughs organised their own events, with concerts, amateur theatre, exhibitions, pageants and sports. They also set about tidying bomb-damaged sites, planting gardens and making other environmental improvements to neighbourhoods. Much of the Museum of London’s collection of Festival of Britain material was collected by Peter Kneebone, who worked for the Festival Office from 1948. In November 1950 he was appointed Western European representative and became one of the Festival’s roving ambassadors. He was posted to Paris, and travelled across Europe to promote the Festival. During this time he amassed a large collection of ephemera documenting how the Festival was celebrated in London and across the country, as well as the international marketing campaign. He later developed a career as a graphic designer. He died in 1990, aged 66, in Paris.